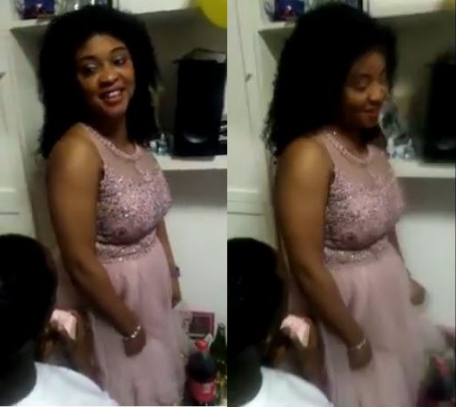 A Nigerian man based abroad was humiliated and left stranded after staging a surprise marriage proposal to his 'girlfriend' during her birthday party. The man got on his knees and brought out the ring for the proposal at the lady’s birthday party which happened recently in Europe (believed to be Italy), only for the lady to shake her head and turn him down. The humiliated man still knelt down after being rejected openly as friends at the birthday party urged the lady to take the ring and accept him, but she still refused. Nigerian on social media have reacted to the incident which was captured on camera, with some blasting the lady for rejecting the guy while others criticized the guy for not being 'sure' first.